Derbyshire, which is the major county in the Peak District is world famous for its well dressing. They can be seen from May to September throughout the county. Probably the most well known village that has well dressing is Tissington which is the first village to hold their well dressing festival in May. Most well dressings are of a similar form. Near the well will be a large wooden frame containing a picture made out natural materials. The predominant material is petal leaves. The technicalities of the construction is that the wooden frame is full of nails, a little like a bed of nails. Into this frame is spread clay, about 25mm (1") thick. This will have been collected seven to ten days before the festival. During the intervening period it is 'puddled' - a process whereby the well dressers walk over the clay in much the same way as grapes used to be pressed. This has the effect of softening the clay and makes the removal of stones, grit, twigs, and other unwanted contaminates easier. A little salt is added to the clay to assist with its water retention. Then the image is marked out with seeds, small stones, or coffee beans, in much the same way a child's colouring book looks. Then the coloured images are filled in with petals, Hydrangea are good for blue skies, moss for greens and bark for trees and buildings. No self respecting well dresser uses any paint whatsoever. They will use diverse natural materials such as eggshell, lichen, straw, wool, stone or coal to give their well dressing the colours it requires. It will take a proficient well dresser about seven hours to attach all the petals. They are laid like tiles so that any rain will run over the petals and off the bottom of the picture. Rain is not the biggest threat to the pictures. Most rain will run off of the pictures, but wind will cause the clay to dry out, then it will crack and the petals may be blown away. The best time to see the dressed wells is in the first three or four days after they have been erected. The index lists villages on the route that have well dressings. See also a comprehensive list of well dressings which includes well dressing within the Peak District National Park and many villages and towns outside the Peak National Park which have well dressings. There is no definitive explanation as to why they were started. It is thought that they originated in pagan rituals or sacrifices to water gods as a thanks for past supplies and a request for continuing future deliveries. With much of the Peak District residing on porous limestone, water could, at times, be in short supply. The scarifies are thought to have been replaced by the colourful decoration as a tribute to the gods. It is known that the Romans made similar offering to their gods and one theory says that they probably brought this custom to Derbyshire. Unfortunately, no similar custom exists in modern Italy. So, the most favoured theory has the custom originating before the Romans and that is was a Celtic custom that managed to survive the successive invasions of Romans, Saxons, Danes, and Normans. What is more certain is that the early Christian Church absorbed the pagan rite into it. The early Christian Church has an history of absorbing rather than suppressing pagan customs. Why else is Christmas day so close to the shortest day? In pagan times this was a time of rejoicing as the days would now get longer. And why is Easter a moveable feast? The name Easter comes from Eastre, an ancient Anglo-Saxon goddess, originally of the dawn. In pagan times an annual spring festival was held in her honour. Some Easter customs have come from this and other pre-Christian spring festivals. Thus, most modern day well dressing coincides with religious festivals with the pictures depicting a biblical or moral theme. Indeed, one primary school has used the paintings of L.S Lowry, who lived that later part of his life in Derbyshire, for its well dressing. 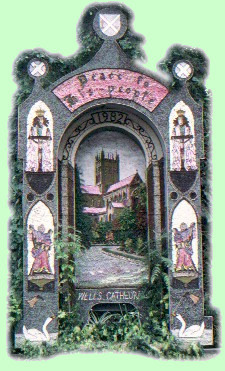 As part of the absorbing of the well dressing tradition, it is thought the the Christian Church gradually changes the well dressing themes to a religious theme and allowed the well dressings to be more complicated with the modern day picture frames. Although many of the wells are not in active use, the tradition of well dressing survives to this day. Well Dressings that have recently been taken down - you can also see all previous Well Dressings. Well Dressing that has just been put up in the last few days and today would be a good time to see the Well Dressings in their prime condition. Well Dressing that has been up for more than a few days and its condition may be deteriorating. Well Dressing that will be put up in the next 2 weeks. Well Dressing that has not yet been put up and are at least 2 weeks from being put up. If your village or town's well dressing is not shown on our list, or you have a definite date for next year's well dressing, please contact us and let us know.